My children, in a back-to-school consumer mode that would warm the hearts of economic analysts and mall managers alike, are in love with battery-powered pencil sharpeners. Don't ask me how this came about. This has me worried about their development of small-muscle skills. 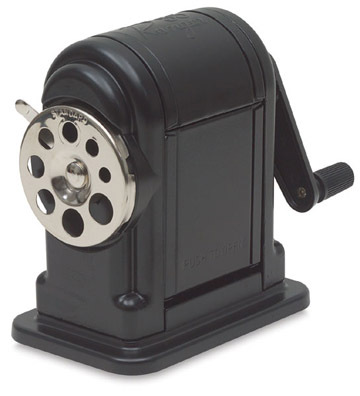 Will an over-reliance on battery-powered pencil sharpeners prevent them from developing the hand coordination and forearm strength that years of manual pencil sharpening allowed my generation to enjoy? Will our country fall behind in the pencil-sharpening skills race? Because I am a middle-aged and sometimes "helicopter" parent (I've been known to occasionally sharpen a pencil for my child), this is but one of the many worries I have for my children's generation as I compare their childhood experiences with my own. My concern with pencil-sharpener skills also plays into one of the discussions surrounding the Rising Star Awards. The Rising Stars, as anyone reading this publication knows, are awarded to young federal employees who have shown unusual resilience and talent in dealing with the numerous challenges federal employment can throw at them. As I read bios for this year's recipients, images pop into my head of people swimming through shark-infested waters, rope gritted in their teeth, as they tow lunch to some fellow employees. The discussion I'm referring to is about the challenges themselves. Whenever federal employees and employment are discussed, there is an immediate side conversation about what the government can and should be doing to attract and keep the best talent. There is always a comparison to the private sector, and the words "performance-based pay" and "bureaucracy" appear somewhere. My thought is, similar to giving our children battery-powered pencil sharpeners, why do we want to make it easy? Is this helping these people become the best federal employees they can be? Shouldn't we be grateful that current government hiring and employment practices weed out those who expect better compensation and support? We aren't doing them any favors by creating a federal youth soccer league, where no score is kept and everyone gets a trophy. I for one am happy to know that the agency personnel I am dealing with are there because of their fanatical devotion to government work, not because it was the best-paying job available. In fact, I propose we take it a couple of steps further: Don't advertise any job openings, relocate agency offices to undisclosed locations, and include a skills test consisting of candidates finding their way from Seattle, Wash., to Washington, D.C., using only public transportation, surviving for one week from a vending machine at the Environmental Protection Agency, and having to sit through two consecutive showings of Man of the Year without any refreshments for any who still insist on working for the federal government. And don't give them any pencils.